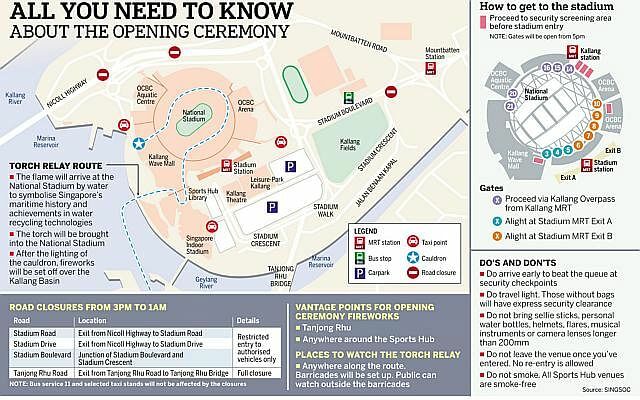 Those looking to catch the SEA Games' opening ceremony this evening should expect traffic delays as roads leading to the National Stadium will be closed to the public. From 3pm to 1am, the exit from Tanjong Rhu Road to Tanjong Rhu Bridge will be closed. During this period, entry to Stadium Road and Stadium Drive from the Nicoll Highway exits, and to Stadium Boulevard from the junction of Stadium Boulevard and Stadium Crescent, leading to the Sports Hub, will be restricted to vehicles with the appropriate labels. The public is encouraged to take public transport instead during this period, as bus and train services as well as selected taxi stands will not be affected. Handicapped, infirm and elderly spectators can take taxis and drop off at the OCBC Arena, where ushers will be standing by to provide directions. To avoid long queues at the security screening points, ticket holders are encouraged to arrive early. Tickets, which are sold out, are valid only for one-time entry and no re-entry is allowed. Selfie sticks, food and drinks including water bottles, helmets, flares, musical instruments and camera lenses longer than 200mm will not be allowed into the venue.